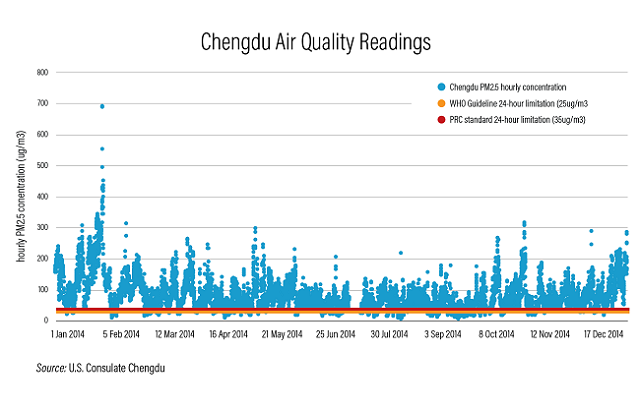 This is the third installment of WRI’s China’s Clean Air Challenge blog series. This series examines the increasing social, environmental and economic impacts of the serious air quality challenge in Chinese cities and investigates the sources of emissions and sustainable solutions. Economic loss from transport-related air pollution in Chengdu, China, was $3 billion in 2013, and that number is on the rise. Private cars and trucks are the biggest emitters, contributing $2.2 billion in losses, 73 percent of the total. With increasing motorization between 2005 and 2013, economic costs from emissions more than doubled. A significant portion of this economic loss stems from the health impacts of air pollution. There is a strong link between air pollution, particularly ultra-fine particle pollution (PM2.5), and cardiovascular diseases and lung cancer. More than one billion Chinese citizens are considered exposed to PM2.5 and therefore at risk for premature death and chronic illness, which result in a lower quality of life, the loss of a productive labor force and high medical expenses. In 2013, air pollution caused 1.2-1.6 million premature deaths in China. Furthermore, air pollution’s environmental impacts, such as smog and damaged ecosystem services, make the city less attractive to corporate investment. Chengdu, the fourth largest city in China, has over 15 million residents and 4 million vehicles, with 27 percent of PM2.5 emissions coming from transport, increasing risks to public health, the environment and the economy. 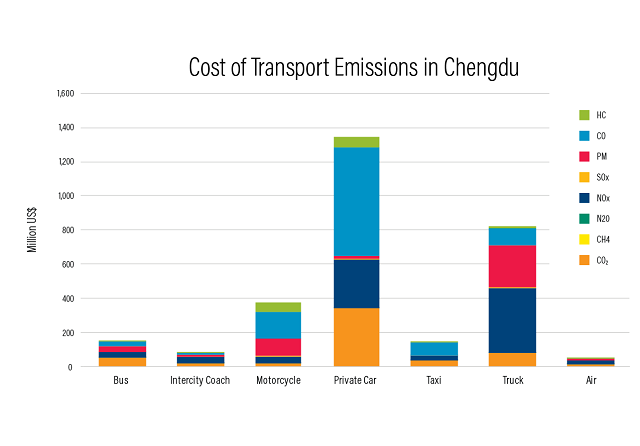 WRI China is providing recommendations to Chengdu’s government under WRI’s Sustainable and Livable Cities Initiative, on methods to reduce transport-related emissions. The recommendations focus on a package of transport demand management (TDM) measures and technological innovations that can be implemented in three phases, starting with strictest, regulatory measures and moving toward market-based solutions. Control vehicle ownership: Limit the purchase of new vehicles to less than 100,000 per year. Strict parking management: Raise parking fees and fines in the central district. Introduce smart parking management with varying fees, according to the district and time of day. Restrict traffic: Limit vehicle use under an “odd-even” system where license plate numbers are used to determine which vehicles can be used on which days. Encourage new mobility: Promote electric and hybrid vehicles and introduce strict emissions standards and green technologies, especially for trucks. Encourage a sharing economy for driving, cycling and freight transport. Chengdu should supplement regulatory measures with more market-based approaches to dissuade people from driving. The city could follow the examples of Singapore, Tokyo and Hong Kong by raising parking fees in the central district and introducing a high vehicle-ownership fee. Revenue from these fees could be used to improve the public transport system, increasing ridership up to 60 percent. By 2030, more than 20 million people will live in Chengdu, and the number of daily trips could easily surpass 50 million. 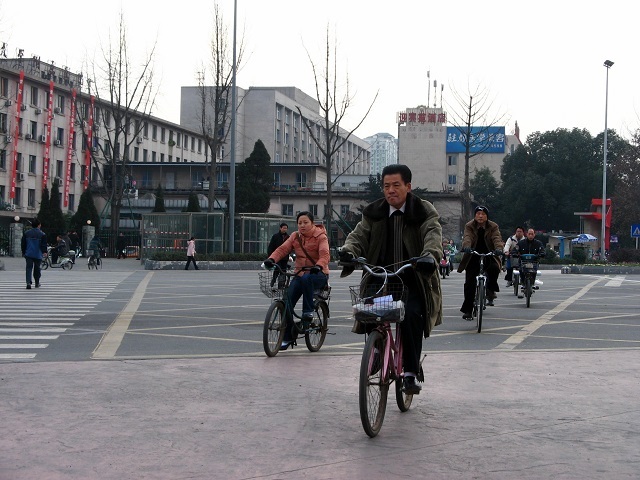 Chengdu needs to plan now to enable its public transport system and road network to adapt. The city should adopt advanced information technologies and transport demand management measures such as low emission zones, congestion charging, shared mobility and autonomous vehicles. By 2050, there will be 2.5 billion more people in the world’s urban areas, with 90 percent of this growth concentrated in Asia and Africa. With more Chengdu-sized megacities popping up around the globe, it will be increasingly important to follow WRI China’s recommendations and protect urban air quality from transport-related emissions. Minimizing economic loss from emissions and ensuring healthier environments and residents will create a stronger urban future.